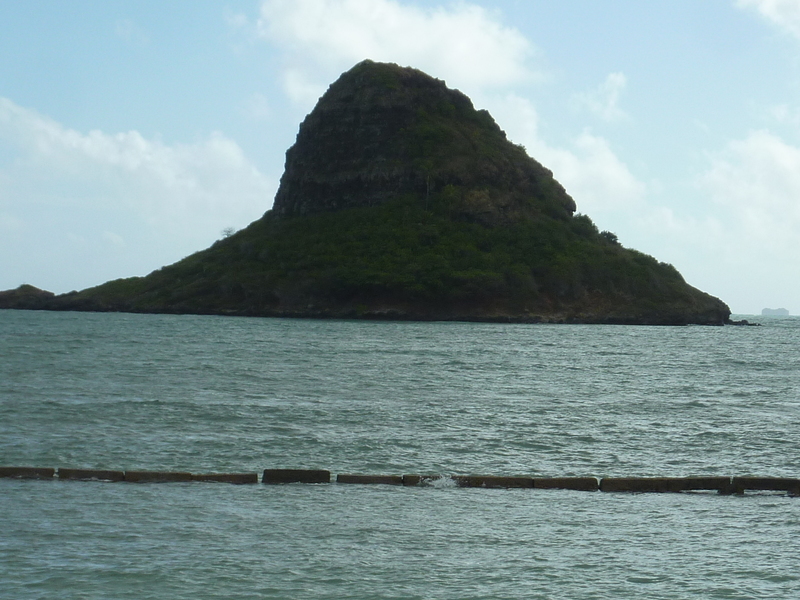 Chinamans Hat is a small island off the windward side of Oahu, a few miles south of where we were staying in Ka'a'awa. I had viewed it numerous times driving to and from our bungalow over the past week and had just recently found that one can climb to the summit. The island lies only a third of a mile offshore from Kualoa Point, a state park/beach open to camping, picnicking and your usual beach activities. They say you can walk to the island at low tide in water only waist deep. Rather than have to time it for the tide and rush to get back before the tide rises, we planned to snorkel out to the island and then climb to the summit via a use trail. I didn't do enough reading to know where exactly to land and what side of the summit to climb it from (from shore, it looks difficult on all side). My wife decided not to join us on this one - it was a bit more than what she would consider "fun", but both kids were very excited - one of the more unusual adventures I'd taken them on. It took us less than 30min to swim out to the island, easier than we had guessed. The kids had life vests on while I had a dry bag (with electronics, shirts, gatorade and some snacks) around one shoulder that made for a good flotation device. We had to fight a modest current flowing through the channel north to south, nothing a little vectoring couldn't adjust for. The water was anywhere from waist to shoulder high coming and going, the sea bottom a collection of reef and sand with weak visibility and almost no fish to be seen. The area has a reputation for hammerhead sharks but we saw no such creatures. The island was deserted when we started out, but a couple paddling a kayak would beat us there by 10-15min. We landed at the narrow neck to the northeast for no other reason that it looked easier, even if a somewhat longer swim. The better landing is the point closest to Oahu on the west side where we saw the kayak docked as we swam by. After landing I put on a shirt and hat as we stowed our gear well above the waterline and headed up the first thing we found that looked like a trail. It took us up to base of the East Face where things got scary-looking in a hurry. It wouldn't work to continue, but I noted a faint trail traversing the base of the cliffs and led us around the south side of the feature, eventually circling around to the west side where it was more obvious where the easiest route was. As we were climbing up we came across the kayak couple going a little slower. We passed them with a neat little class 3 bypass step just below the summit and beat them to the top by about 30sec. The top has a large enough perch to host a small party. There's a battered benchmark but the best feature is the view from the 200-foot summit, overlooking Kaneohe Bay, the Pacific Ocean and Puu Kanehoalani to the northwest. We hung around the summit, exchanging photo ops with our new friends for a short time before descending back down and finishing our circumnavigation of the island. The kids played around in the tidepools on the west side for another ten or fifteen minutes before we suited up for the swim back. The return was a little easier since we were now helped by the current. I saw no fish this time, but I did find a full rod and reel on the bottom about halfway across. It was covered with green moss with the look that it had been there a few years already, so I returned it to its new home and finished the swim back to Kualoa Point. We all agreed it was the best Christmas adventure, ever. We met up with Mom back at the bungalow, had lunch at the Lau Lau truck near the (closed for Christmas) Huli Huli Chicken truck on the south side of Ka'a'awa, and headed to Diamond Head for an afternoon activity. It's a silly little hike that's wildly popular and Christmas Day saw no smaller crowd than the last time I was here a few summers ago. All our friends were there eating shaved ice and drinking from straws out of young coconuts, a cacophony of folks being folks, some complaining, most having a good time and more than a few breathing hard on the 200+ stairs one takes to reach the highpoint. There are a million TRs one can read about Diamond Head and I've really nothing to add to the body of work already written, so I'll just leave it with we too had fun, survived, and lived to tell more tales another day.